A family reunion under the Texas sky... Star-gazing on your daughter's Sweet 16... Roasting your favorite co-worker with a rock-and-roll light show... Presenting a life-time achievement award to a star volunteer. You can have it all at UTA Planetarium! The dome and atrium are both available to you and your guests as a unique venue for a truly memorable private event experience! The dome seats 150 and is the perfect setting for presentations, ceremonies, and other gatherings. If you'd like a show projected onto the dome during your event, we'll work with you to select one that will complement your occasion. 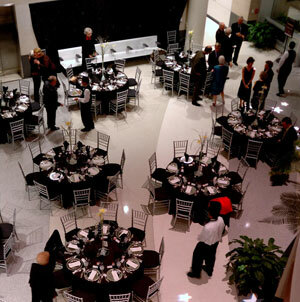 The atrium is a perfect event space for receptions, dinners, or informal gatherings and can hold 50 people seated comfortably or up to 75 standing. The ShowBook is a full list of all the shows we offer. UTA Planetarium is a great way to spend your anniversary or propose to your special someone. Eat a private dinner under a beautiful nighttime sky for a romantic night out. A three-course meal, wine service, and a custom show are included in your private two-hour dinner. Photos and music for the custom show must be submitted no later than two-weeks before your event. To begin, simply submit a private party request.